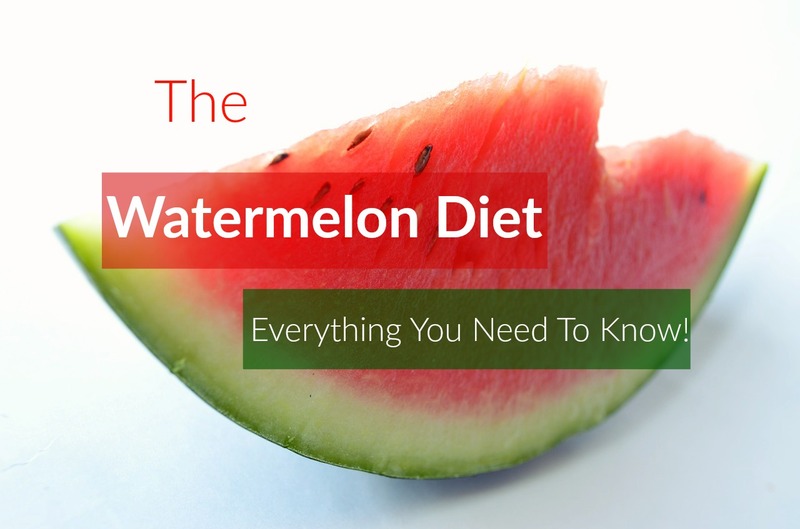 Home » Blog » Watermelon Diet: Everything You Need To Know! The watermelon diet is a new fad diet you’ll find circling the web. There are many versions of this diet, but all of them come down to one basic principle – you only eat watermelons for the first few days and then switch to other foods. The effects of watermelon are well observed in several scientific studies. There are also plenty of online testimonials supporting the watermelon diet. In this article, we explain the potential benefits of the watermelon diet. We will also provide you with guidelines for your own watermelon diet plan. The rats in this study were given watermelon pomade juice or water for 4 weeks. At the end of the study, the scientists found that rats administered watermelon had less body fat, lower levels of glucose in their blood and increased blood flow due to better blood vessel dilatation. The health benefits of watermelon come from citrulline, a type of amino acid that is converted into arginine in the body that is responsible for the synthesis of nitric oxide (NO). NO is a major vasodilator (which contributes to reducing blood pressure) and it is found to be at very low levels in obese individuals. Arginine boosts NO and improves blood flow and this is the reason why a watermelon detox works so good. Watermelon also contains lycopene ( a bright red carotene and carotenoid pigment). This powerful antioxidant is not linked to fat loss or weight reduction. Watermelon is high in Glutathione (GSH) an important antioxidant that protects your body from free radical damage. Watermelon is also a good source of Potassium (an essential dietary mineral and electrolyte). This is particularly important to those of us who have weight loss goals. Now that you know that watermelon can help your metabolism by improving blood circulation and cardiovascular health, you might be wondering what other benefits are there to the watermelon diet. We all know the health benefits of fruits. Eating a diet high in fruits will provide your body with vitamins, minerals, antioxidants and other micro-nutrients essential for good health. Watermelon is a great option for a fruit diet because it is very low in calories and it keeps you feeling full for a long time. Watermelon contains between 92% and 95% water and is also rich in dietary fiber – both of which can make you feel full for a long time and make you eat less. There are many versions of the watermelon diet and you can adjust it to your own likings. But the basic principle is to eat only watermelon for the first three days of the diet and afterward start including other light meals alongside watermelon. This could be too restrictive for most people. As a safer option, you can replace a single daily meal with a serving of watermelon. The diet should last for two weeks or even longer if you feel you can do it. As far as the dose is concerned, you are supposed to eat a pound of watermelon on every 10 pounds of your body weight. Also, keep in mind that watermelon is high in water and you might not feel the need to drink water as much. If you don’t feel well after the first day, you should skip the diet and talk to your physician about your plans. Those suffering from heart disease, kidney diseases, high blood pressure, and pregnant women should not follow this diet. Your kidneys will also filter out your blood better and your body will go through a deep cleanse and detox process, all of which make losing weight easier. Those with myocardial infarction are also advised to stay away from this diet because the drastic increase in NO levels might be fatal for these people. Otherwise, healthy people won’t experience any dangerous symptoms. Those who suffer from excess weight and diabetes may benefit from this diet but they need to talk to their physician before starting the diet. Relatively healthy people can try this diet if they want to lose weight or detox their body. But, since this is an extreme type of diet, you do need to take necessary precautions if you suffer any kind of disease. If you are following a blood groups diet recommended to you by a physician, the watermelon diet is said to be suitable for blood types A and especially AB. The watermelon diet is a favorite among fad diets these days, but it is also supported by scientific evidence. Watermelon improves blood flow, boosts the metabolism and offers a full detox when followed correctly. The main point is if you feel good following this diet, then it is suitable for you, but if you feel very uncomfortable and ill, then you should try another diet and skip this one. If you are looking for healthy foods to add to your diet, consider watermelon one of them. Katleen Brown is a health, beauty and fitness writer. She loves to publish her articles on various health related websites. In her spare time, likes to do research to bring awareness. Get in touch with her on Google+, Pinterest and Twitter.